Since the very first CTP beta, I have been asking for some kind of a direct access to the Delta-Stores and Deleted Bitmaps, especially their respective sizes were of interest to me. The only answers from Microsoft I have got were that it was absolutely impossible for the current version. Well, today I have found a way to consult them. An unsupported one, since some of the system views used in the queries might be changed not from Version to Version but even with a Service Pack or Cummulative Update. If you look for information about sys.system_internals_partitions view, there is nothing particularly informative to be found in internet. The only Microsoft page that is easy to find is the one which has some basic information about type of information stored in the view. According to the link above, it contains a combination of rowset and hobt information. There is a one-to-one correspondence between rowset and hobt. The more precise information on this DMV you can find at the article about Table internals from brilliant Remus Rusanu. I have spent some time looking into sys.system_internals_partitions and some other views to found a lot of very interesting informations, that there are some views, such as sys.dm_db_partition_stats that are using this DMV internally and that they have quite an interesting number of informations exposed and documented in their respective definition bodies. Observing the columns available in the view, we can see a number of very interesting ones, such as is_columnstore which are quite new to SQL Server (available since 2012 version), and the owner_type which is principally the most important column in our case. Note that in both cases is_columnstore column should contain value 0 (false), because both of them are not actual Segments. 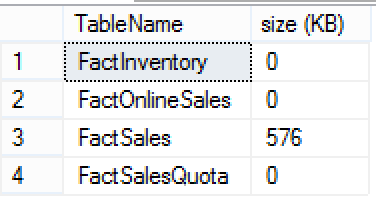 In this case we are very clearly seeing the respective unique Deleted Bitmaps for each of our four fact tables with Clustered Columnstore Indexes. There are no Delta-Stores at the moment, because we have just created a our Columnstore Index. Notice, that I did not included Segment Columnstore structures into the result of my query. This time we have a new addition (5th row) which is a Delta-Store containing 150 rows as expected. One of the visible columns on the picture is the is_unique, confirming that a Delta-Store is indeed a structure, which doest not control if the data is unique or not. This is all very interesting, but there are absolutely no columns about what size all of those structures do have! There is a DMV sys.allocation_units which is documented and which contains the information on how to use it. This time we have success! We have all our 5 distinct elements (4 empty Deleted Bitmaps plus 1 open Delta-Store) all listed with the detailed information on which pages are being used and how. Notice that I have added having object_name(object_id) is not null; to the Delta-Stores size query, this is one of the cases I am still battling because in one of my DB I am getting a number of Delta-Stores with non-identifieable object_ids and partition_ids. I hope to update this blog post one day, once I understand why this is happening. Regarding the orphaned delta stores: Try deleting all objects from that database. Restart the instance. Are there still orphaned delta stored? Then, it is a bug in SQL Server. Congratulations to your discovery. thank you for the comment, I have deleted every table in the DB but those elements still persisted in a sys.system_internals_partitions – maybe they are some kind of information that was allocated in time and waiting to be removed by some ghost cleanup. Note that I did rebuild every table before trying to get rid of it. This DMV sys.system_internals_partitions is unsupported and I feel that it is a kind of normal that some information that is not intended for the final user’s usage is available there. The database requires 17.406.361.600 additional free bytes, while only 4.425.625.600 bytes are available.